The information contained within these notes will help simplify many issues that pertained to lateral/medial hoof balance, dorsal/palmar hoof balance, as well as establishing a reliable formula for detecting and treating hoof deformities and distortions before they have a negative affect on the performance and soundness of horses. What makes this information easy to apply is that finding the widest part of the foot offers the most reliable reference to the distal phalanx. This will help to recognize hoof distortions long before they become irreversible or seriously damaging to the horse. When I originally studied the feet of feral horses in 1986 & 1987, my purpose was to find consistencies with naturally worn feet that might be valuable in treating lameness in domestic horses, as well as preventing lameness. This information opened the door to research expanding in slightly different directions. For one, the sole and frog seemed to be an active part of weight-bearing, which was a new thought for some farriers and veterinarians. It has also been shown that domestic feet wear exactly the same when the environment and lifestyle will maintain the feet optimally. An important part of the feral hoof information was the discovery of the sole callus and how it stopped the foot from wearing closer to the apex of the frog and into the distal phalanx. Dr. Robert Bowker's research on lamina density with barefooted horses helps to understand what Dave Duckett talked about in the late 1980’s and early 1990’s regarding “pillars”. The pillars appeared to be stronger portions of the sole seen in the medial and lateral toe quarters of the foot. It is also shown that the lamina is more dense in the areas of the medial and lateral toe quarters on barefooted horses according to lamina counting done by Dr. Bowker. The denser lamina is consistent with the imprint marks made on the foot from the hoof study of the feral horses. It was also noted by Bowker that some feral horses had no secondary lamina between the two pillar points on the dorsal aspect of the distal phalanx. This seemed to suggest that the wall forward of the pillars was not utilized for weight-bearing when the foot was loaded on the pillars and flat to the ground. Moreover, the friction that occurs at the time of breakover is what wore the foot to this rolled, rounded form. The friction was obviously less stressful than the impact in normal movement because the wear was always maintained close the distal border of the distal phalanx. The part that is still difficult for many horsemen to accept is that the wear that occurs on the front of the foot is a normal event. Dave Duckett's work in the late 1980’s and early 1990’s suggests that breakover occurs at the same spot that the imprint marks were found, and at the same position that we see naturally worn domestic horse’s feet. However, many of our conventional ideas of breakover are based on domestic feet that have distortions. Because hoof distortion was, and is something that we commonly see, it is considered normal and used by many as the optimal model. The goal of this paper is to offer ways to recognize distortions, and get a clearer picture of what is actually NORMAL, as opposed to what is COMMON. The first and primary tool I use to evaluate the balance of the foot is similar to what Duckett refers to as the Bridge. However, it is more commonly recognized today as the widest part of the foot, or more specifically the widest part of the sole. If you can learn to quickly and accurately identify the widest part of the foot at the sole level, you will consistently be able to find the tip of the distal phalanx (coffin bone) and balance the foot around the boney column. A combination of 3 approaches is used to accurately identify the widest part of the foot. The first step is to locate the TRUE frog apex. This is not always easy because it generally requires some assertive trimming to find the true origin of the frog from the sole. The widest part of the foot is generally about 1” behind the TRUE frog apex. (Figure 1-A) However, if the frog apex appears to be stretched and pulled forward, you must employ the other methods to get a more accurate assessment. The second method is to find the place where the bars terminate into the frog commissures. If you run a pick along the commissures, you will feel or see a bulge or swell where the bars appear to terminate. (Figure 1-B) A line across the foot at that point should be very close to the widest part. Third, and generally the most accurate, is to actually exfoliate the sole from the toe quarters to the heels on each side (meaning remove the chalky material until the waxy appearing surface is revealed). Then, using a marker, draw a line at the wall/sole junction from the toe quarters to the heel. Mark a line at the apex or peak of the arc you’ve just drawn. (Figure 1-C) Connect the mark from one side to the other. This line is reliably the widest part of the sole. If through the use of all 3 methods you find the lines you have drawn all fall on top of each other, you can rest assure that you are quite accurate with you assessment of the widest part of the foot. From this line, you can measure forward approximately 2” (on a #00 - #2 size foot), to find the tip of the distal phalanx (give or take 1/8” to 1/4” or so). To use that information for trimming or for applying shoes, we then draw a line approximately ¼” ahead of the line at the approximate tip of the coffin bone to mark where we would like to place the point of breakover. (Figure 2-A) The breakover point of the shoe or the role of the toe (if barefoot) should fall over this location. The most caudal bearing point should be the back of the frog if the horse is barefoot, as the frog will typically take precedence over the heel once the heels are trimmed. (Figure 2-B) If the horse is shod, the heels of the shoe should be located at the most palmer aspect of the frog. The anterior/posterior ratio is generally 50/50 around the widest part of the foot. From that we know the foot is equally proportioned around the articulating surface of the Distal Interphalangeal (DIP) joint. On most horses, having the ratios equal around the widest part of the foot is usually sufficient. However, in many horses it is seen to be more beneficial to have more support base behind the widest part than in front, since the back of the foot is better designed for support and weight bearing. If you see a horse with more mass ahead of the widest part of the foot than behind, then you have a hoof with distortions. It’s that simple! There has been divided controversy on shoe wear, particularly that which occurs at the toe. Some feel that shoe wear should be prevented and others feel that the shoe wear should be allowed to occur in light of the way the natural foot wears without shoes. In a natural environment it appears that the toe will wear a roll on the same part of the sole surface relative to the distal border of the distal phalanx on horses without shoes. However, with shoes placed around the perimeter of the wall, the wear does not occur quickly enough to find the optimal place for breakover before the next shoeing period do to the resistance of the metal. Therefore, the excessive wear that is commonly seen can be a good thing, in that it acts as an indication that moving the breakover back might assist in relieving the excess leverage, especially if some lameness is present. Adjusting the breakover has for some time been shown to be helpful for those horses that have Navicular related problems, as well as ligament and tendon issues of the DIP joint. Perhaps if we read the warnings in the shoe wear, we could address those needs before these Navicular related issues and soft tissue damages occur. A closer look at shoe wear makes it easy to understand why metal is being removed in the manner that it is, and more wear is common when the dorsal wall has become a greater distance ahead of the widest part of the foot. It appears as though the excessive leverage that is necessary to pivot over the front of the foot creates extra wear. It is common knowledge that the inferior check ligament controls the tension on the deep digital flexor tendon, and there is very little-to-no stretching of the DDFT that occurs below the knee. This is the same mechanism that allows the horse to stand while sleeping without falling down. When the knee becomes rigid prior to the breakover phase of the stride, the leverage creates friction as the limb passes over the toe. Wear then occurs on the distal end of the dorsal wall or the front of the shoe. This fits very well with the position of Duckett’s Pillars and the findings of the toe wear seen on the feral horses. These findings are the same as the naturally maintained feet of domestic horses and worn shoes from everyday horses. That pivot point seen through radiographs of naturally worn feet and reported by Dr. Barbara Page in 1999 at the AAEP, show that from the anterior distal border of the distal phalanx, approximately one quarter of an inch or 6 mm, is where the point of breakover is located. When you see a horse that has an obvious long toe and a broken back pastern axis, conventional standards for hoof trimming are to remove the toe portion of the foot from the bottom and leave the heel in order to align the distal phalanges. Serious complications can be derived from trimming the hoof aggressively (which happens) in order to achieve alignment, especially with feet that have a severe condition of poor pastern alignment. It's been noted that trimming close to the sensitive area of the sole can be responsible for causing dorsal wall hoof distortion. The tissue that surrounds the distal border of the distal phalanx (in light of the terminal papillae) seems to be as much of a bonding structure as it is protective sole material for the internal structures of the distal phalanx. When the foot is trimmed too close, the dorsal wall seems to detach at the distal end of the distal phalanx in the toe area between the two medial and lateral toe pillars. This can be easily noticed by the frog being deformed and stretched forward at the same proportions as the dorsal wall. The stretched frog can be noticed long before pathology has occurred. There seems to be a scar tissue forming between the distal border of the distal phalanx and the interface of the dorsal wall. We’ve demonstrated this by driving nails through the sole behind the lamina on feet that have major hoof distortions occurring in the anterior wall, similar to laminitic feet but none seen to be pathologic. This phenomena in-of-itself should alert us that hoof balance looked at primarily from using the external hoof wall, should be revisited. I believe hoof balance needs to include references that are more consistent with the distal phalanx. What's even more apparent now is that we've been able to see the pathology that occurs around the Distal Interphalangeal joint with the collateral ligaments, the flexor tendon, and the impar ligament as a result of the excessive leverage created by the distortion seen with the longer toe that we thought was normal. This appears to parallel cases of Navicular related issues associated with soft tissue injuries where no significant changes to the Navicular Bone are noted. It’s common to fit shoes with plenty of width in order to provide a wide base of support. However, in light of information regarding collateral ligament injuries as well as coffin joint pathology, rethinking the concept of a wide base of support and perimeter fit would be helpful in preventing lower limb pathologies. A shorter toe and medial/lateral breakover positioned inside the wall perimeter (much like a naturally worn foot), becomes even more important as a horse extends the pastern prior to liftoff, especially while engaging a corner at the same time. If you increase leverages beyond what is normal or practical, and then ask the horse to do maneuvers and circles in a non-yielding or even partially yielding surface, the DIP joint is going to be challenged. Pastern alignment in a static position is important. However, even more important is the alignment of the distal phalanges at the time of ground contact and foot loading. Simply engaging the back of the foot first by landing heel-first with the frog close to the ground will align the DIP joint upon ground contact. The ability of the horse to land slightly heel-first is highly influenced by the freedom it has to move over the toe. In other words, if the horse cannot get its foot off the ground in a timely manner, it is unlikely that the foot will land heel-first. Alignment of the distal phalanges upon ground contact is critical when the ground reaction forces are the greatest. It must be noted that if there is a delay or more effort is required at the time of breakover, then the horse is more likely to engage the ground toe-first, causing a caudal movement of the pastern at the time of ground contact prior to loading. If you focus above the coronary band you will see the pastern move to the rear prior to loading on horses that have a short stride and land toe-first. According to verbal reports of MRI and ultrasound findings, and as predicted by Dr. Rooney some years ago, damage to the soft tissue in and around the DIP joint is likely. Heels that run forward often develop corns, and usually belong to those horses that fail to land heel-first as a result of pain from heel distortion. Early recognition of this condition will enable the farrier an opportunity to alter this distortion before pain occurs. It is common to see bruising occurring at the place where the bars terminate, which is ventral to the Navicular bone. The distortion of the heels growing forward and bending inward, forces the tissue of the bars and sole into the center of the foot at its widest part. This condition can be altered by simply trimming the extra height from the heel to the level of the sole. This not only changes the curvature of the heel but also lengthens the base of support. The heel is positioned more caudal to the rest of the foot and the heel curvature is much straighter. The foundation in the heel buttress is more than stable and suitable for loading, and the frog is in closer proximity to the ground so that normal hoof biomechanics are likely to resume. Do keep in mind that you will probably need to address distortions in the front half of the foot as well, as they seem to go hand-in-hand. It's been shown by Mike Savoldi that the thickness of the functional sole is equal under the ventral border of the distal phalanx. Therefore, trimming each side of the hoof wall the same distance from the exfoliated, functional sole will insure that lateral/medial balance is easily attained. It should be noted however, that you must be very specific about accurately identifying the live, functional sole in order to use it as a guide. If you cut into the sole too aggressively and go through the plane of the live sole/dead sole junction, you will jeopardize your ability to use the sole as a guide. So, tread lightly. The live or functional sole is seen as the waxy appearing surface just below the chalky or exfoliating sole material. If you identify the live sole in the region close to the wall/sole junction, then trim the hoof wall an equal height from that live sole on each side, you have the best opportunity to get the ventral border of the distal phalanx parallel to the ground from side to side. Whether you leave ¼”, 1/8” or NO wall above the level of the sole, balance is achieved as long as you leave the same amount on the opposite side. This method is extremely helpful and much more accurate on those horses that are pigeon-toed or base narrow, because the hoof capsule can be shifted and lose its visual relationship to the coffin bone, and consequently becomes unreliable when sighting in a more conventional way. In short, the live sole is proving to be a much more reliable and less subjective means of evaluating and achieving medial/lateral balance. Hoof distortions, as mentioned earlier, are the primary reason for lameness issues of the Navicular bone, impar ligament, deep digital flexor tendon, and collateral ligaments. Gait faults associated with hoof distortions are the early indicators that lameness is likely to occur. Stumbling is one of the more subtle conditions that is easy to recognize and is often mentioned by the horse owner. Forging is another gait fault that is often justified by breed type, rider’s ability or discipline the horse is asked to perform. However, these are not justifiable excuses now that we understand hoof distortions by mapping out the bottom of the foot using the widest part of the foot, the frog, and the Pillars. Horses that land toe-first are those that are closer to a lameness condition and considered by many veterinarians to be a grade one lame. Hoof conditions that are associated with lower limb lameness are generally those with heels that grow forward much like the dorsal wall, and when they are left taller than they should be, they start to crush, become underrun, and then painful. As a result of this condition, the horse will often land toe-first because of the caudal foot pain that is often associated with distorted heels. At the same time the longer toe affects the timing of breakover which discourages the heel-first landing. It is easy to see this condition in the early stages of distortion. Simply using the true frog apex, termination of the bars, and exfoliated sole in the quarters (as described earlier) will give you the information you need to evaluate hoof distortion. If the front portion (from the widest part to the point of breakover) is greater than the back portion, then there is hoof balance disparity. Consequently, extra effort will be required at the time of breakover. When the toe is longer than normal and the pastern moves beyond its normal range, the flexor tendon will lose a portion of its tension and support to the distal interphalangeal joint. The forces are then diverted to the impar ligament, suspensory ligament to the Navicular bone, and the collateral ligaments of the distal interphalangeal joint. A potential for lameness exists with horses that are shod with a flat plate fitted slightly wider than the prepared foot so that there a visible portion of the shoe around the perimeter of the hoof wall. The extra width and length is perceived as support; however the stress on the collateral ligaments and deep digital flexor tendon at the time of breakover increases when the perimeters are increased. Moreover, the strain to the DIP Joint is even greater when horses are engaged in circles and turning. With the technology available to us, deep flexor lesions, collateral and impar ligament strains, and coffin joint disease appear to have a fairly common cause. Considering this, it becomes easy to see how the natural wear or aggressive hoof wall wear on hard surfaces provides unilateral freedom to the foot, and may be beneficial to relieving some of the discomforts to the distal interphalangeal joint. 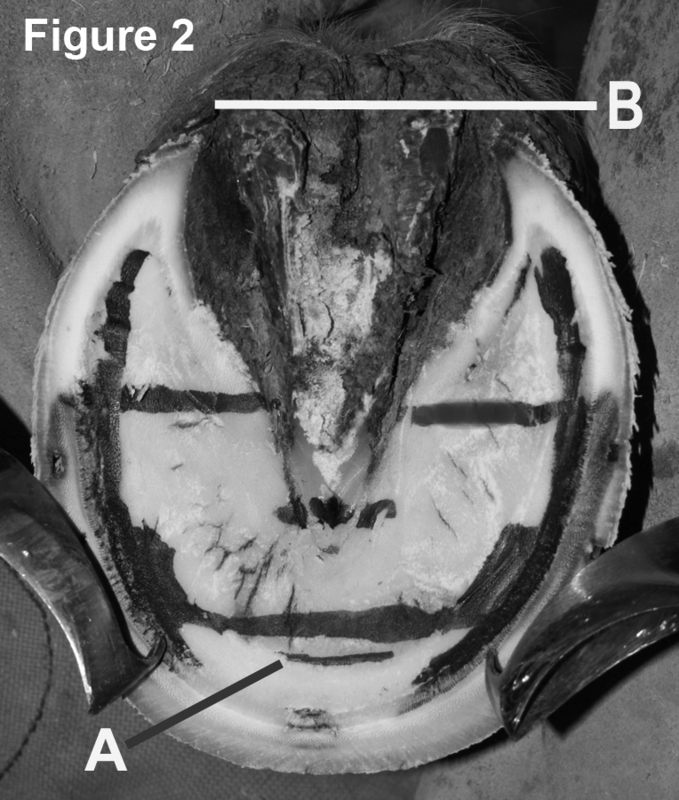 The work of Mike Savoldi, Robert Bowker, and Dave Duckett, plus the information from the naturally worn foot of the feral horse, as well as the naturally worn foot of the domestic horse, appear to offer a commonsense approach to a possible solution, or at least a direction for resolving the issues regarding pathology seen in-and-around the DIP joint. Many critics contend that the naturally worn foot is not valuable for domestic horse hoof maintenance. Keep in mind that horses were not intended to be ridden, and yet the foot (in its natural state) has been worn consistently to relieve strain on the distal interphalangeal joint. If we add extra strain and stress to the animal and their feet with a rider, a saddle, and disciplines that are challenging to the whole horse, why would we add extra length and width to the foot that only increases the leverage forces around the distal interphalangeal joint? Nearly all horseshoe manufacturers have become aware of the needs of the industry and are producing shoe styles and types to accommodate these excessive leverage forces in their newer products, and the benefits are being seen in the horses. Keep in mind that the most valuable technique that can easily be used, is mapping out the foot to determine distortions of early and potential lameness situations. These same guidelines can be used in normal, everyday shoeing and maintenance practices as a means of preventing lameness as well.